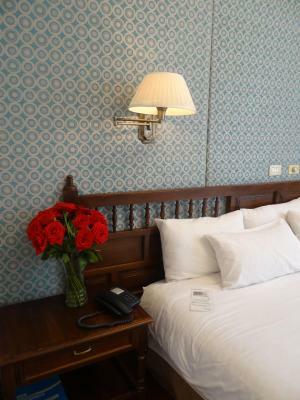 Lock in a great price for Hotel Real Audiencia – rated 8.5 by recent guests! Clean, comfortable rooms with great beds. Staff very helpful, esp with information and the hotel wifi connection. All together a good choice for Quito. 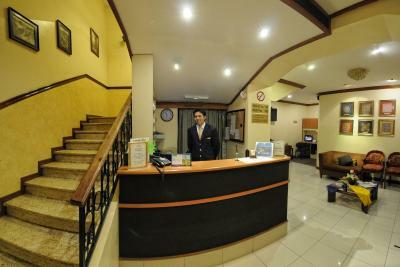 Very good location ,nice staff who could give me good advices for 1 free day in Quito. The staff was warm, friendly and very helpful, and the location was good for moving around the old city. The view from the dining room is lovely. 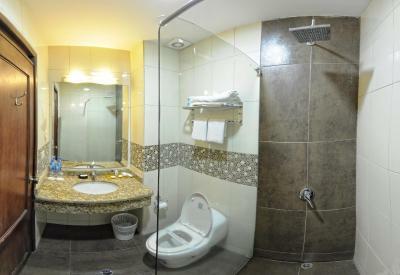 The room and bath were comfortable in size and the hot water ample. 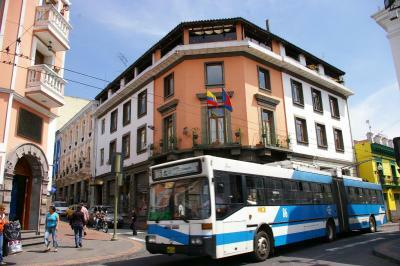 I travel to Quito every February and this is the only hotel I would ever stay in. 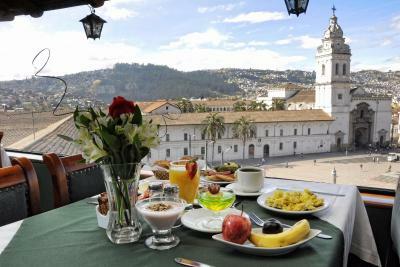 Clean, comfortable, affordable, located in the heart of the central historic area, breakfast is wonderful with panoramic views while you eat, you will not find at better hotel in Quito! Great central location. Staff was helpful. Large water cooler and hot water for easy fill up in the lobby was very helpful. Great spot to access everything we wanted to do in the city. 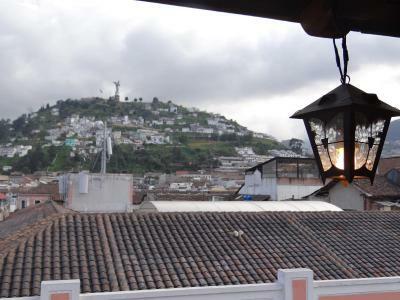 Restaurant has an amazing view of La VIrgen de Quito. Breakfast was plentiful. Staff very helpful. Room very clean. The staff is outstanding!! Very friendly and helpful. Great location. Easy access to all major old town historical buildings. Location was good, room was nice looking, good modern shower, good double glaze windows for sound proofing, safety deposit box in room. Hotel Real Audiencia This rating is a reflection of how the property compares to the industry standard when it comes to price, facilities and services available. It's based on a self-evaluation by the property. Use this rating to help choose your stay! Real Audiencia is located in Quito's colonial Plaza de Santo Domingo, and offers a panoramic view of the Santo Domingo Church. 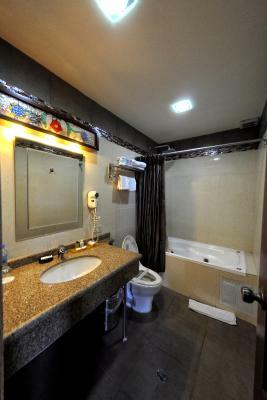 Rooms feature traditional décor, free WiFi, and cable TV. 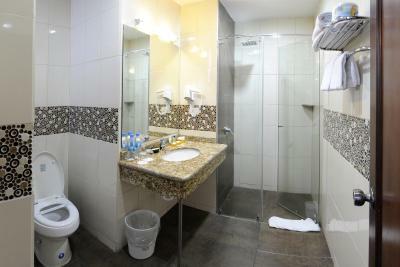 All rooms at Hotel Real Audiencia have free bottled water and private bathrooms. Some include a separate lounge area or a mezzanine floor. 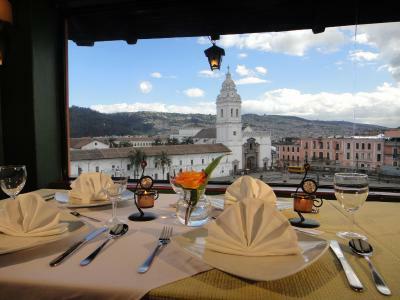 Open all day long, the hotel's highlight is the Panoramic Restaurant, offering impressive views of Santo Domingo Church. 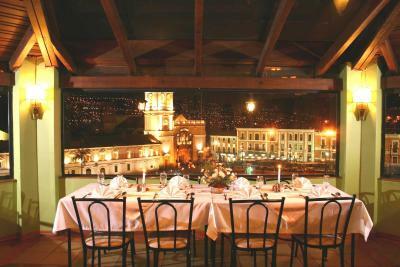 Guests can choose between international dishes and traditional Ecuadorian recipes. A free American buffetbreakfast is served daily. A tour desk is offered, along with a business center and a luggage storage service, while transfers can be arranged for an additional cost. 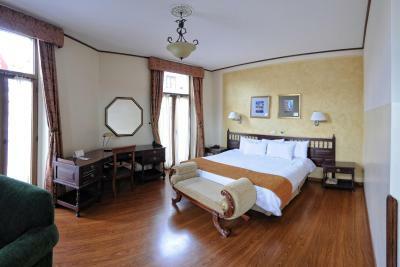 The hotel is located in the on the Plaza de Santo Domingo, one of the first colonial squares in Quito, surrounded by churches, monasteries and museums. It is also 8 blocks away from La Panecillo Park. 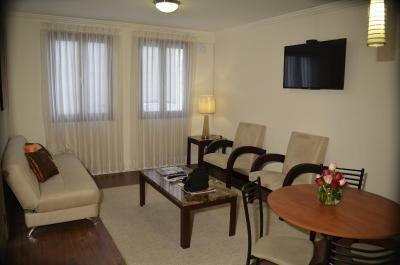 When would you like to stay at Hotel Real Audiencia? Private parking is available at a location nearby (reservation is needed) and costs USD 12 per day. 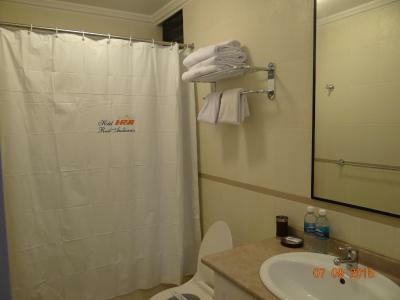 Features a king-size bed and a private bathroom. 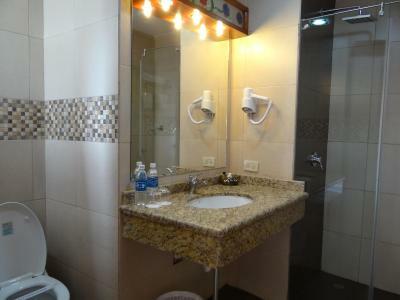 Larger suites featuring double-glazed windows, a lounge area and views of Santo Domingo Square. Hotel surroundings – This neighborhood is a great choice for travelers interested in architecture, churches and museums – Check location Excellent location – show map Guests loved walking around the neighborhood! House Rules Hotel Real Audiencia takes special requests – add in the next step! One child from 5 to 12 years is charged USD 25 per person per night in a crib. Hotel Real Audiencia accepts these cards and reserves the right to temporarily hold an amount prior to arrival. The location and customer service. WiFi worked for only first day. Told staff but still did not work for 3 days. It did not bother me, but the fact that there is no elevator can be a problema for people with impaired mobility, as the breakfast room is on the upper floor, On cloudy days, the breakfast room is quite chilly as there is no heating at all. 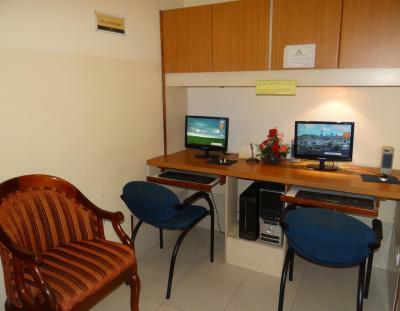 The location of this hotel is excellent, two minutes on foot from the Plaza de Santo Domingo and very close to many other places of interest. The staff members are very efficient and kind. 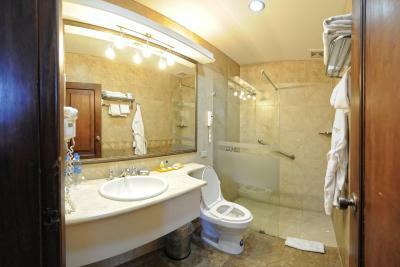 The rooms are large, full of light, quiet, with comfortable beds and large enough bathrooms with plenty of warm wáter at any time. Breakfast is good, with many choices, also for vegetarians. Staff were very helpful and accommodating even with a delayed late night flight arrival. Driver was at the airport, having waited, and was cheerful and chatty on the 45 min ride into Quito. Morning breakfast had a nice variety and was tasty. Our room was very clean and comfortable with over bed lights for reading. With all our gear for 35 days of travel we were not crowded. They also have a safe in the rooms. The view from the restaurant was wonderful! The property is a bit tired, with scuffed and dirty walls that need maintenance. There are no comfortable common areas (e.g., lobby or landings) to sit outside the room, and the emergency evacuation routes (e.g., in case of fire) seem limited (main stairway and ladders outside windows that do not open?). Great place. 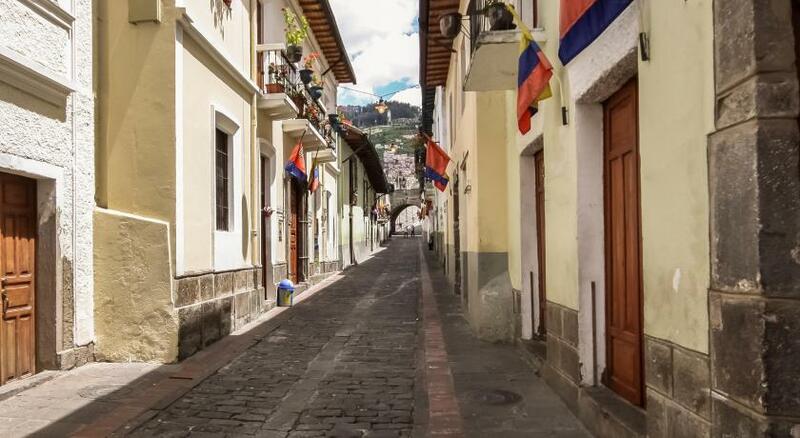 Right in the heart of Quito. Staff very helpful. Little bit loud being next to the Plaza. The restaurant options for breakfast are limited and on a few days it appeared as though fruit not eaten the day before was served again. (Dried out, lost freshness). I would prepare gueats that the location is on the corner of two busy streets so there will be nouse at night, especially on the weekend.